Arnold was a four-time All-Southeastern Conference choice in college as well as consensus All-American as a senior in 1982. He was chosen by the Kansas City Chiefs in the fifth round of the ‘83 NFL draft and led the league with a 44.9 average in 1984 and received second-team All-NFL honors from the Associated Press. A lesser performance in 1985 set the stage for his release prior to the ’86 season and he was picked up by Detroit for the last seven games, averaging 42.6 yards on 36 punts. Lions went 4-11 to finish fifth in the NFC Central in the strike-affected season. Arnold followed up with another Pro Bowl year in 1988 after punting a team-record 97 times for a 42.4-yard average, which topped the NFC. 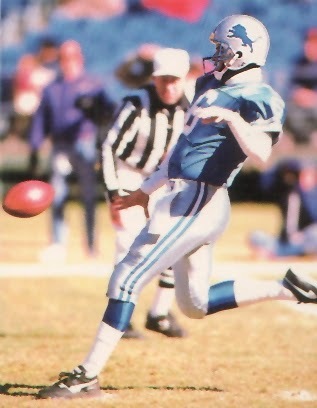 He ended up playing a total of eight years for the Lions and set a franchise career record with 536 punts, averaging 42.7 yards per kick. He played for the Miami Dolphins in 1994 before retiring. Overall, he punted 866 times over 12 seasons for a 42.3-yard average with five blocked. He was named to the Pro Bowl twice and received first- or second-team All-NFL honors on three occasions.